So I’m sitting here on a snowy afternoon at the end of December and I have to say I’m not sure what day it is. I think it’s Thursday? Between holidays, storms, and school vacation days, it’s all become a blur of candlelight, chocolate gelt, wrapping paper, cellophane bags of sweet things I shouldn’t be eating, new books, classic movies, sparkling lights, eggnog, and a scattering of appointments here and there. I’ve lost my fragile hold on my internal calendar. Okay, I’ve verified my hunch with the computer’s calendar and don’t feel like a complete dope. December the 29th. We’re within arm’s reach of the end of 2016, which I think many of us can agree has been a bit of a disaster. As if we weren’t on our knees already, the universe sees fit to take Carrie Fisher and Debbie Reynolds just as we thought we might sneak under the wire and leave this year quietly behind. I don’t know a soul who hasn’t lost someone dear to them this year. I feel foolish in my sadness at the loss of two women I’ve never met. I know I should feel this grief for the thousands of Syrians who lost their lives this year. For the children who met their fate with a bullet. For the families who never made it from one shore to the other. But it’s too large for me to feel it all, and instead I’m vacuuming the house while singing “Good Morning” with tears in my eyes. So maybe this is how we compartmentalize a larger grief, and how we share with a world of other hearts a general outcry at the unfairness of time and mortality. But that’s not what I want to think about here on the brink of the year. I want to think about the snow falling down, quiet as a candle, erasing the sky and pulling a discreet white sheet over the earth. I want to think about this goofy, faithful dog, with just a little bit of grey on his chin, curled into an “O” in front of the fire. I want to think about a tall daughter, sitting at this same table, listening to music as she draws, still here under our roof. I want to think about a tender husband about to get into his car to drive home to us through this storm, on tires that are fast friends with snow and ice. I want to imagine Al Green crooning to the mated pair of cardinals who are visiting our feeder today, to the chickadees, to the nuthatches, to the woodpeckers, to the blue jays, to the juncos, to the tufted titmice, to the woman with the camera: Let’s all stay together. Oh…teary now. So many warm thoughts for you and yours as the New Year approaches. Love to all. And here I was expecting Marvin Gaye, not the Reverend Al to lead us out. Perfect thoughts, thanks R.
Well said. I also was wondering the other day why the deaths of Carrie Fisher and Debbie Reynolds hit me so hard. Like most of us, I am just panting to get to the end of this year. The song I have been hearing in my head is One Voice by the Wailin’ Jennys. 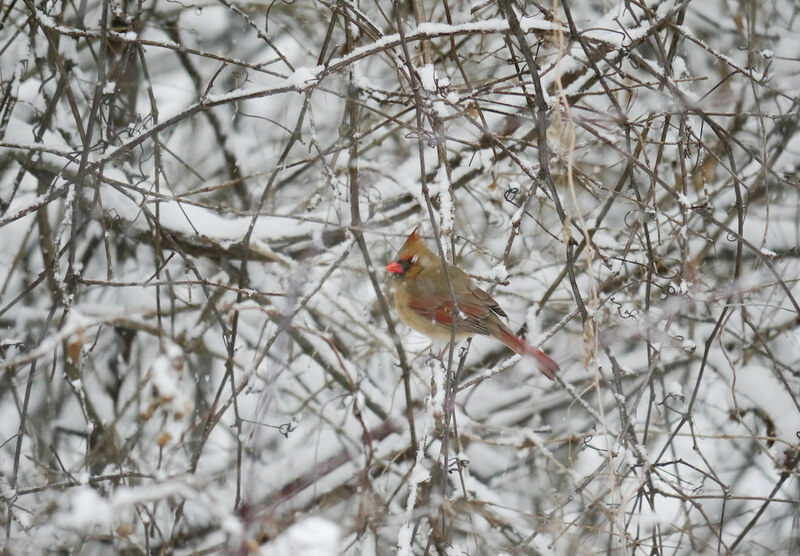 And that cardinal… Love her!